Review: Robert Miller is a troubled hedge fund magnate. He is trying to complete the sale of his trading empire to a major bank before the depths of his fraud are revealed. The trading empire makes an error in which he then finds himself juggling family life, business and crime. He turns to an unlikely person for help. When I first heard about this film and looked at the front cover I thought it was just going to be one of these nuts and bolts movie where they were going to be shooting at each other the whole time. How wrong I was. So much better than I anticipated. Richard Gere acted really well. One of his best performances. Richard Gere replaced Al Pacino in this film. 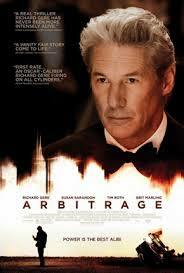 One film critic wrote “Arbitrage is a rewarding, thought-provoking movie that deserves to find a wide audience”.